Ideal Tax Solution, LLC is expediting its customer service platform to accommodate the rising number of tax resolution inquiries from individuals and businesses interested in securing immediate and effective tax debt relief. Ideal Tax Solution, LLC remains steadfast in its determination to help a widening legion of troubled taxpayers who are discovering the benefits of utilizing professional tax resolution companies for quick and effective tax liability relief. As more and more individuals and businesses find themselves in need of experienced tax debt help, trained tax relief specialists are also finding themselves increasingly busy fielding calls and answering questions about everything from the IRS collection process to the time it would take to effectively resolve lingering tax liability issues. 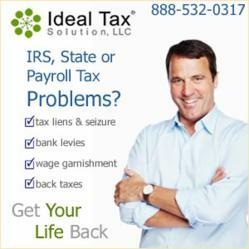 The tax debt specialists at Ideal Tax Solution utilize their experience with the IRS on a daily basis, interacting with the Internal Revenue Service on behalf of troubled taxpayers who suddenly find themselves in delinquent taxpayer status. Having to endure the bright spotlight of a tax status review by the IRS can be nothing less than life altering for many whose only true offense was not taking the time to thoroughly review their tax return themselves before an IRS agent did it for them. Simple mistakes and honest miscalculations account for a large percentage of tax debt cases. Sometimes a call to the IRS by an offending taxpayer can help, but only if the issue(s) being discussed is determined to be minor and non-purposeful, and, only if an expeditious and satisfactory tax liability resolution can be achieved without lengthy and laborious negotiation. Tax problem specialists like the professionals at Ideal Tax Solution, are experts in cutting through the layers of misunderstanding and non-effective communication which can so often derail a tax debt resolution process. As an individual being reviewed by the IRS, it can be difficult saying the right things and taking the appropriate action when your entire lifestyle could crash based on an inaccurate response or improper procedural action. We are human beings and always doing what’s best in the midst of a tax debt collection process is not only difficult, it is unrealistic. Professional tax resolution companies like Ideal Tax Solution remove the guesswork of ‘what to say’ and ‘when to say it’, and instead replace it with knowledgeable information meant to quickly, painlessly and without undo emotion, provide life-changing positive results. Tax liability relief specialists have evolved from the financial services industry into tax help experts who have developed a comprehensive understanding of the tax code and the very human issues surrounding tax debt resolution…and the benefits which can last a lifetime!